Italy, 1948, 79 minutes, Black and white. The Human Voice: Anna Magnani. The Miracle: Anna Magnani, Federico Fellini. L' Amore was a controversial Italian film of 1948. Roberto Rossellini had been making films during World War Two but emerged on the international scene with his films Rome, Open City and Paisan. Rossellini, along with Vittorio de Sica and other directors of the time, created what was called neo-realism in style for films which got to grips with realistic and naturalistic stories in their own culture. With L' Amore, he chose two short stories. 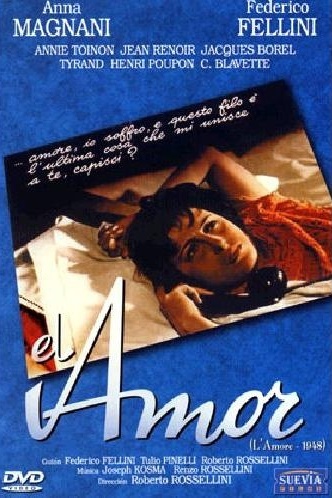 The first is The Human Voice in which Anna Magnani spends most of the film on the telephone. This was written by celebrated French playwright Jean Cocteau. The second part was The Miracle. This was the segment that caused controversy, especially in New York City when the film was to be screened at the New York film festival. A Catholic delegation, led by Cardinal Spellman (who later led protests against Jane Russell in The French Line and against Elia Kazan’s version of Tennessee Williams’ Baby Doll)protested against the film as being blasphemous. The film went to the courts and the Supreme Court ruled that films were a significant medium for the communication of ideas. It is pointed out that this was the first time the First Amendment to the Constitution covered film and freedom of speech. The Miracle is particularly interesting for a Catholic audience. It is a focus on a simple young woman who becomes pregnant. The parallel is made with the Virgin Mary. However, the man responsible for the pregnancy is played by Fellini himself, in a part that seems to resemble St Joseph?. With this paralleling of the gospel story, many people who took it absolutely literally found it more blasphemous than enlightening. This was the same situation with Jean-Luc? Godard’s Hail Mary in the mid-1980s. these, inviting audience empathy? The skilled acting of Anna Magnani? 2. The complimentary aspects of the two stories: a woman in love and in pain, the man and his use of the woman and hurting her? The woman's ability and inability to cope? The genuineness of feeling in such love? Emotional suffering? 3. Black and white photography, semi-classical score? The contrast of the confinement of the first story and moving from room to room and the speaking on the phone compared with the wider scope of the village, the outdoor sequences? The first emotions being indoors, the second out of doors? 1. The impact of our seeing Anna Magnani alone – her presence in the various rooms, at the wash basin, the bed, talking to the dog, on the phone, the clutter and oppressive nature of her room? Her description of it on the phone, representing her emotional clutter and confusion? The night setting and the references to the time? 2. The importance of the telephone, as a means of communication, her comment on it being the only link? The fragility of the line and her continually being cut off? The phone as an artificial means of communication, non visual, the effect of verbal communication - and the man's lies as to where he was? The various segments of the woman's conversation, the various moods? The presence of the man in the story through the woman's words, way of address, emotions, hurt? 3. The intensity of Anna Magnani's performance – the quality of the feeling, the nature of the suffering her telling lies about her moods, her changing and telling the truth? The varying moods and the emotional outburst, the tight-lipped telling of the truth? The impact of discovering his lies as to where he was? Her continually excusing him? Filling in the background information about the attachment, the situation for five years, their fighting, her saying she saw the photo of his new girlfriend? Giuseppe and his role, her talking to him on the phone? The dog and possession of the dog? The man's calling back each time - why? To console her or to hurt her? 4. How well were his attitudes communicated, via her emotional response? Was there any justification for his moving away from her and leaving her? 5. The presentation of her pain - suggestions of suicide at the oasis, her comments about suicide, depression? The outpouring lies, the colder and harder attitude in telling the truth? What had been achieved by the end of the story, the portrait of pain? 6. The strains of love hate relationships between men and women? 1. The initial reaction to this story and the different kind of story that it presented? The response of audiences and critics and the church in the fifties? Condemnations of blasphemy, censoring, forbidding the showing of the film? The suggestion as regards the Virgin Mary and the parallel of her being mad, seduced? Or rather was it a fable of a woman suffering and exploited - with the religious background of Christianity and its story of the Virginal conception and birth? The ambiguity in the writing of Federico Fellini - in this story, in the light of his subsequent writing? 2. The quality and ambiguities of Fellini's story and its blending of the human with the miraculous? His playing the role of the stranger mistaken for St Joseph? His appearance, his not speaking, his listening and not listening to Nanni, his sinister calculations, his sexual abuse of her and his disappearance? The comment on the man? 3. Anna Magnani's portrait of Nanni, the contrast with the earlier portrait? Her place in the village, her madness, age, her work, alone with the animals? The encounter with the stranger and the suggestion of the appearance of St. Joseph? Her religious madness? Seeing her and this apparition within the landscapes and the background of the sea? Her incessant talk, her projecting her images on to the stranger? The importance of the religious vision to her? Her explaining her background and history? The importance of the vision, her drinking and chattering, was she aware or unaware of what would happen to her sexually? Was the episode credible? 4. Her awareness of her pregnancy and the automatic understanding of virginal conception? Why did she not understand that she had been raped? People's reaction - especially the calculated mockery of the younger people, the contrast with the kinder older people? The vagabonds around the village and their rejection of her? The mockery of the religious suggestion? 5. The experience for Nanni and her various moods? Caring for the child within her, not doing any work? Her pride, joy, religious feeling? 6. The experience of the whole village turning against her, the procession scene and then the mockery, her running away, her experience of herself as an outcast? The film's comment on people's religious feelings by this harsh behaviour?